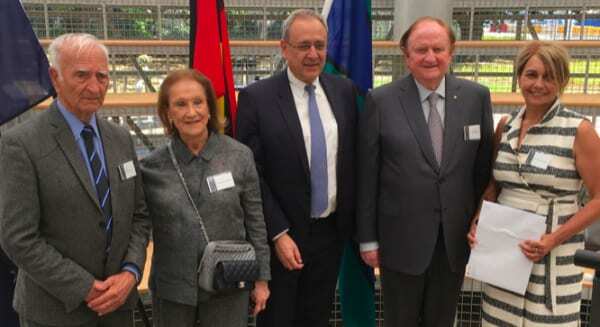 On the 80th anniversary of William Cooper’s historic protest about Nazi Germany’s treatment of Jews, Monash University in partnership with John and Pauline Gandel has launched the William Cooper Indigenous Scholarship Program. Indigenous elder, Yorta Yorta man and human rights activist William Cooper famously led a protest and attempted to hand a petition to the German consulate in Melbourne after Kristallnacht in 1938. The German consulate refused to accept the petition at the time, and it had to wait until 2012 for German Consul General Michael Richard Pierce to accept the petition. The Scholarship Program was launched at Monash University, Clayton today, honouring the leadership of William Cooper in the presence of John and Pauline Gandel, Deputy Vice-Chancellor Prof Sue Elliott, Pro-Vice-Chancellor (Indigenous) Prof Jacinta Elston, Uncle Boydie Turner (grandson of William Cooper), Leoni Drummond (great-granddaughter of William Cooper), Israeli Ambassador HE Mark Sofer, President of ECAJ Anton Block, President of JCCV Jennifer Huppert, Jewish and Indigenous community leaders. The program will support two high potential Indigenous Australians each year, who have experienced educational disadvantage and will create a pipeline of Indigenous graduates who will contribute to and become leaders in the community. Prof Elston described the importance of the scholarship program and thanked the Gandel family for their support of this and other scholarship programs, continuing to help the most vulnerable and marginalised in the community. Recipients of other Gandel Philanthropy funded scholarships attended the launch as a direct reminder of who directly benefits from these scholarships. Mr Gandel gave a passionate and inspiring speech about William Cooper’s legacy of leadership, courage and compassion. He said it was also notable particularly since Indigenous people did not have Australian citizenship in 1938, and were not considered citizens until 1948. He noted that William Cooper’s grandson Uncle Boydie actually participated on the walk as a boy with his grandfather at the time. Mr Gandel said it was most important that his legacy should be an inspiration to future generations to stand up for what is right. Uncle Boydie’s daughter Lenoi Drummond gave a moving and heartfelt speech, thanking the Gandel family, especially for the statue of William Cooper which now resides on Yorta Yorta land in Shepparton. The formal launch ended with a remarkable performance by Yorta Yorta dancers. To further commemorate the 80th anniversary, the William Cooper Legacy Project and the Jewish Community Council of Victoria (JCCV) have organised a walk of remembrance today, 6 December 2018, meeting at the Flagstaff Gardens at 6:30pm to remember and re-commit to his legacy. Read this article just posted about the Partisans’ Song in Noongar, translated By Jesse John Fleay of ECU. A World First At Carmel School Perth Australia!